I just wanted to show you all my Scorbot setup with some custom conveyor work that I put together using Industrial Flex-link conveyor chain. I’ve been using several models of the Scorbot series robots for more than five years now, talk about fun. I finally got my controller-A interfaced properly and running very smoothly with ATS ACL software. 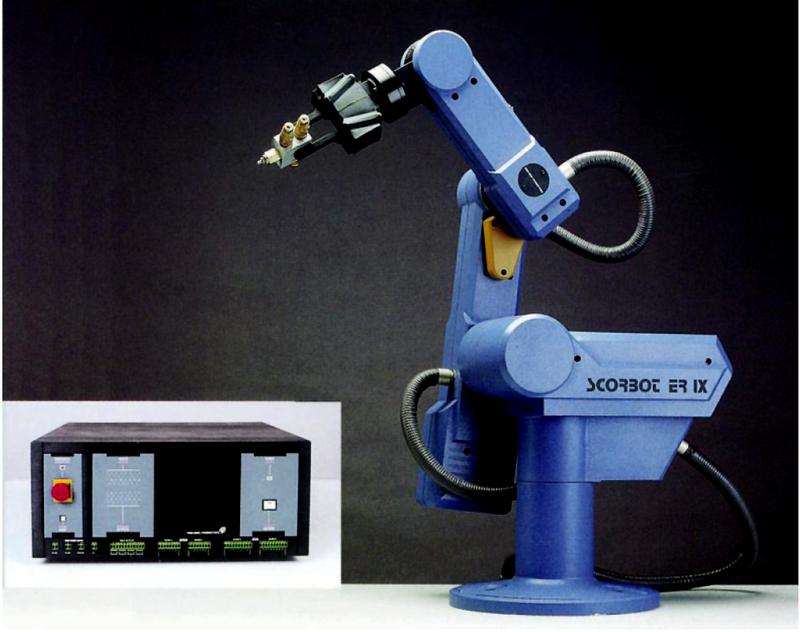 The Scorbase software for the ER-III controller is ok too, but I prefer using the controller-A ACL software, so on that note the ER-III connected to this controller is essentially a mod to an ER-V robot. My plan is to mod a ER-4PC that I have to an ER-V Plus and run it with the controller-A unit as well. I’m also doing some work with CRS 265 robots, fun fun! Here’s a few shoots from the building phase. Some New Flex-Link chain I just got to build a new conveyor table with the Drive unit under the table for Continuous Flow, as compared to the previous model shown above. The Drive Unit is on top of the chain which prevents continuous flow. I just connect some sensors in front of the drive wheel to stop the conveyor. In any case, it’s Pretty Sweet! Here is a yahoo group Devoted to Scorbots with lots of resources. It has lots of documentation and computer related interfacing and programming, many experience users have joined. Just curious… What will you be doing with it? At this point it’s strictly a hobby and mainly just to learn …it’s crazy fun. My end goal is to research and experiment with Video Image analysis using MatLab software. Interfacing a CCD video camera that can capture objects being moved after the program has begun. Feedback data is sent to the controller from MatLab and the robot re-calibrates itself to compensate while running it’s program. A friend of mine did some work on this while in University. It was so amazing, trying to fool the robot by moving the block and it was like you were trying to steel a piece of candy from a child or something. Regardless of where you move an object for the robot to grab, the robot followed and still picked up the object. Pretty old school stuff actually, they first did this back in the early 80’s… but it’s lots of fun regardless. A few other Pics of some Scorbots I used in College. Pretty sweet. And here is an ER-XI Sorbot. This one uses the Controller-B unlike the ER-VII that uses the Controller-A. Don’t forget to check out my Scorbot YouTube Channel !! Thanks for the appreciative reply! It’s been a while since I made a post here. I’ve made some serious advancements in my Robotics Lab since then. I’ve added a Pneumatics control board to my Lab which allows me to control compressed air into various Pneumatic Pistons and also some Suction cup end effectors for my Robotic Arms. Check it out! It’s pretty sweet. This above is the Robotics area during the addition phase of the Pneumatics Control board. A BIG mess of junk all over the place. You can see the control board on the Wall to the left. Here above is the Pneumatics Control Board. Which entails a Pressure Regulator and an Air Dryer to remove moisture from the input lines. Also connected, is a Digital Pressure switch for interfacing to the Robot Control Modules. I then have three separate Solenoid Manifold units, for channeling the Air Pressure through various tubes attached. These are essentially decks of electro-magnets that open air flow valves when you send a logic High voltage to the units input connections. Each unit here has eight channels to use. So this gives me a total of 24 Channels to channel the Pressurized air into different pistons or other Pneumatic devices. You can also see the Vacuum Generator on the Right Bottom side of the Control Board. This device will take a compressed air input and create a vacuum for connecting suction cup end effectors. If you look closely you can see the old school Nintendo PowerGlove. Just so you know the er4pc will work as a er5+ without any changes. I later became aware of this fact, after I made the repairs to my ER4PC. The Robot I purchased had no connector on the main cable. The End was cut off, and seemed whoever owned it was trying to interface it to something. I ended up connecting 6 DB9 connectors for individual hookups to the Driver cards. I then read that the original 50 Pin connector will work fine. I guess I could have looked for a 50 pin connector. I’m also looking into trying some other Robot models. Thinking of purchasing the Mitsubishi RV-M2 movemaster robot as well for some time now. Although I’m also checking into the popular CRS F3 model. They use Absolute encoders which will be great to play with. I have also acquired the software for the F3 so that’s a start. I find allot of the time, these robots are sold with no software. And when they are, they are over 10 Grand $$…ouch!! Have any of you used the ER-VII ? A friend of mine has just purchased one this Christmas. It was from a school closing. We’re having some issues with the Encoder values for the gripper to execute some block size measurements. Maybe the encoder is malfunctioning. Lots of Fun!